We help our clients obtain initial legal status in Quebec and in the rest of Canada as student or worker permit holders, to renew or change their status, to apply for permanent residency, and to become Canadian citizens. Popular permanent residency applications include through sponsorship by a spouse, or based on Canadian work experience or graduation from a Canadian university. You need not give up your citizenship to become Canadian: Ireland, the U.K., and Canada all recognize dual, and even triple, citizenship. Fogarty Law Firm will act as your trusted advisors, not only your lawyers. Consider us as your opportunity enablers, your professional problem solvers. We are happy to speak with you generally about your situation and our different service programs. We will look at your entire situation, not just separate issues you face. To do so, we use our special three-part analysis to explore your experiences, concerns, hopes and goals. This helps clarify how the legal and other elements in your life relate to one another. If you also wish to seek legal advice, we operate by way of an initial, paid consultation. We will advise you regarding the application or procedures you are interested in, and where necessary, to avoid or delay taking certain steps, if acting then would be against your best interests. We may even uncover alternative legal opportunities you did not realize you had. This approach has proved highly successful with our clients. If you engage our Firm’s services within seven days of the paid consultation, the consult fees will be deducted from the professional fees for your case. You are welcome to visit our website, including its Blog, to learn more and to contact us through the webform, or call to arrange an appointment. 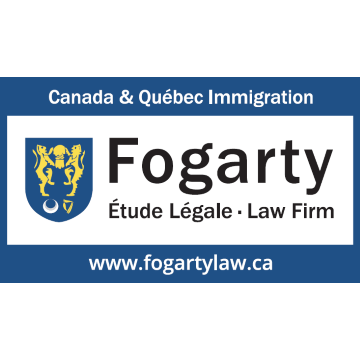 We at Fogarty Law Firm are proud to sponsor the Montreal Shamrocks G.A.C. Mention the Shamrocks when you book your appointment, to benefit from a special promotion regarding your first consultation.